According to Energy Star, a US environmental protection agency that promotes energy efficiency, almost a third of the energy used in your home goes to heating. So making smart decisions about your home’s heating system can have a big effect on your utility bills, not to mention the warmth and comfort you enjoy in your own home. Electric baseboard heaters found in many older homes (and still installed in many new condo buildings) may appear efficient at first glance, but it’s an illusion: baseboard heating is actually a relatively inefficient and expensive way to heat your home, even though it remains one of the most common systems because of it is easy to install and requires no ductwork. Here’s how baseboard heating can work either for or against you. The most common baseboard heaters are electric. These contain electric heating elements inside metal pipes and are controlled by thermostats in each room. 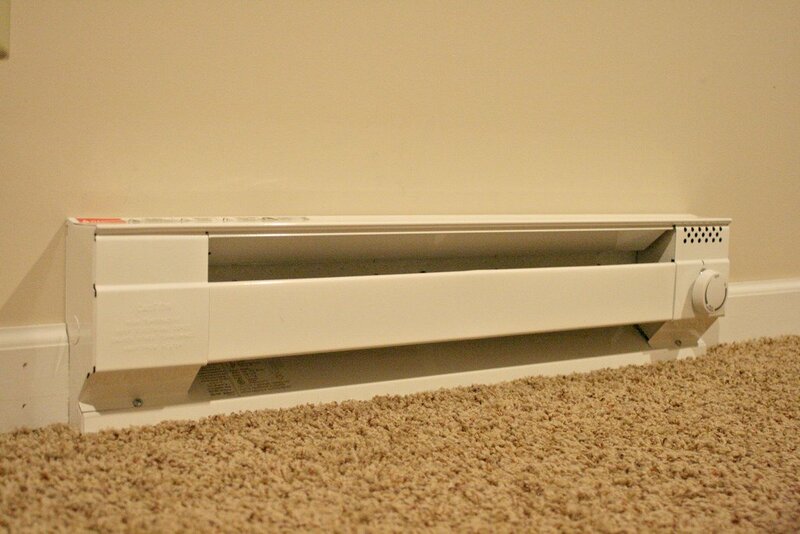 Baseboard heaters rely on convection to move air throughout the room. This makes their placement under windows a necessity, because the cooler air around the windows interacts with the warm air coming from the baseboards, creating a convection effect that distributes the air throughout the room. As cool air falls, it enters the baseboard heater. The air is then warmed through electricity or hot water (this is called a hydronic baseboard heater) and pushed out of the tubing via aluminium fins. This circular process repeats itself to keep a room warm. It is inefficient in that the heat flows up instead of out into the room. Some baseboard heaters are equipped with a thermostat, while others require a wall-mounted thermostat. An advantage of baseboard heat is that it requires no ductwork. This makes it relatively easy to install, particularly in older homes, where adding ducts can often be problematic. Also, whereas forced-air heating ducts should be serviced regularly, there’s little ongoing maintenance to do with baseboard heating. Simply removing lint and dust keeps most baseboard heating systems working without interruption. Other people prefer baseboard heating become the heat comes out relatively evenly, as opposed to intermittent blasts, and that the system, at least with the newer models, runs quietly. Baseboard heating has significant drawbacks. First and last, baseboard heating is expensive, often considerably more expensive than other heating systems, such as forced-air. This is especially true if the baseboard heaters rely strictly on electricity, and this is precisely why they often are used as a supplemental or ‘zone’ heating source. Baseboard heating systems, and especially those with built-in thermostats, can produce inconsistent heat or have difficulty maintaining a set temperature. A wall-mounted thermostat helps counteract these issues. To help preserve heat and lower your utility bill, turn the thermostats down in rooms you are not using, and clean the heaters on a regular basis. This is very easy – just vacuum the heater’s fins and housing. Also, baseboard heating requires regular safety vigilance. The vents must remain unobstructed by furniture, curtains, or other objects. Ignoring these precautions can lead to a fire hazard. People who like baseboard heaters tend to view them as unobtrusive objects that fade into the woodwork, but others can’t get used to seeing them on the floor and worry about stumbling into them, or of their children or pets (mis)handling them. Though inexpensive to purchase, electric baseboards are (in)famous for their inefficiency and high running cost. This means the longer you use them the steeper the rise you’ll see in your utility bill. And it’s for this very reason more than any other that homeowners typically choose electrical baseboard heating as spot (area) warmers only and do not rely on it as a round-the-clock heating solution for the entire house. For more energy efficiency tips and electrical safety information, follow Epic Electric’s blog. Located in beautiful Kelowna, BC, and proudly serving the entire Okanagan Valley, Epic Electric is your expert team of electricians to get the job done swiftly and efficiently. From circuit upgrades to rewiring, and from lighting to heating to safety inspections, call our Kelowna Electricians day or night for all of your electrical needs.